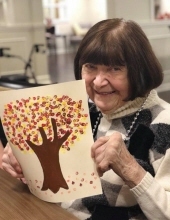 Ida Schoenberg, 95, of Iowa City, passed away Thursday, March 14, 2019 at Legacy Gardens. A memorial service will be at 12:00 PM, Saturday, April 20, 2019 at Davis Funeral Home and Memorial Park in Las Vegas, NV. Ida was born on November 30, 1923 in Revere, Massachusetts, the daughter of Jacob and Jenny (Molofsky) Hyman. She graduated from Dorchester High School for Girls in 1941. Ida was united in marriage to Max Berkowitz in May 1946. From this marriage they had three children. She worked at the Trimount Clothing Co. and Amalgamated Clothing Workers in America in Boston, MA. She was a homemaker and school secretary. Ida was later united in marriage to Bernard Schoenberg in 1974 and together, they ran a butcher shop, delicatessen and catering business; Bernard preceded her in death in November 2016. She enjoyed dancing and singing – especially square dancing – along with traveling and spending time with her family. Ida is survived by her 3 children, Daniel Berkowitz (Holly) of Iowa City, Paul Lamoin (Gary) and Joanne Fletcher (Ellie), both of Eugene, OR; 5 grandchildren, and many extended family members. Ida was preceded in death by her parents, her two sisters (Peggy and Honey) and husband, Bernard Schoenberg. "Email Address" would like to share the life celebration of Ida R. Schoenberg. Click on the "link" to go to share a favorite memory or leave a condolence message for the family.